This is a perfect Crock pot meal. I served this over polenta but mashed potatoes would be good also. I adapted this from a Cooking Light Recipe. 1. Heat a large, heavy skillet over medium-high heat. Add 2 tablespoon oil to pan; swirl to coat. Add half of beef; cook until well browned, turning to brown on all sides. Place browned beef in a slow cooker; sprinkle with 1/8 teaspoon salt. Repeat procedure with remaining 1 tablespoon oil, remaining beef, and 1/8 teaspoon salt. 2. Add onions to pan; cook 1 minute on each side or until browned. Add onions to slow cooker. Add tomato paste to the oil left in the pan; cook 1 minute, stirring constantly. Add 1/2 cup wine, scraping pan to loosen browned bits; cook 2 minutes or until half of liquid evaporates. Add stock and pepper; bring to a simmer. Carefully pour stock mixture into slow cooker; nestle thyme sprigs into liquid. 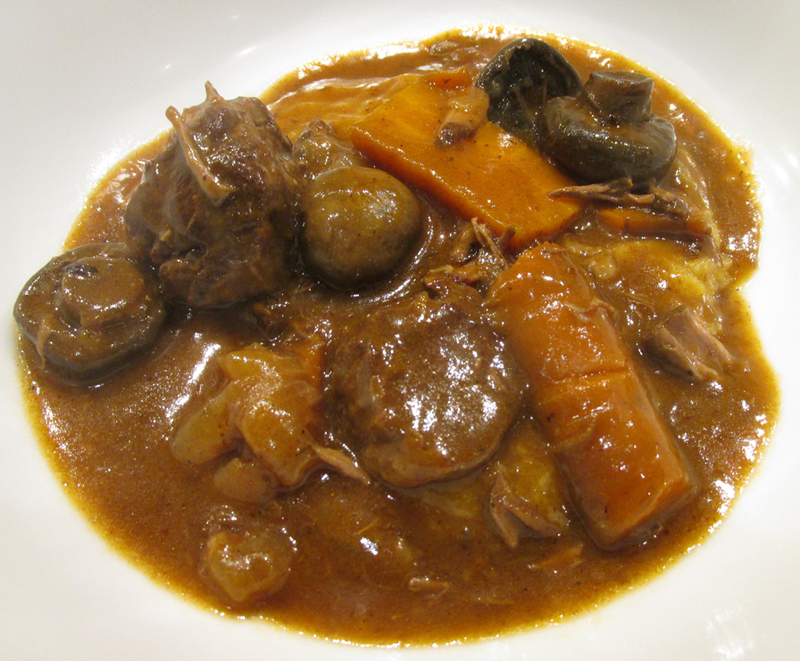 Top beef mixture with mushrooms; scatter carrots and parsnips over the top. 4. 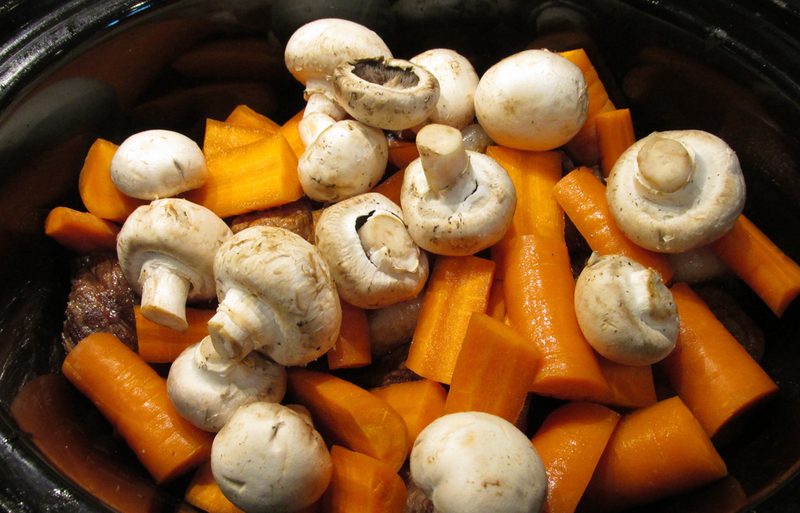 Remove broth from Crock pot and pour in a pan. Bring cooking liquid to a boil; cook 6 minutes or until liquid is reduced to 2 cups. Stir in remaining 3/4 teaspoon salt. Combine remaining 2 tablespoons wine and flour, stirring with a whisk to form a slurry. Stir into cooking liquid; cook 1 minute or until bubbly and thickened, stirring constantly. Pour over beef mixture; toss gently to combine.